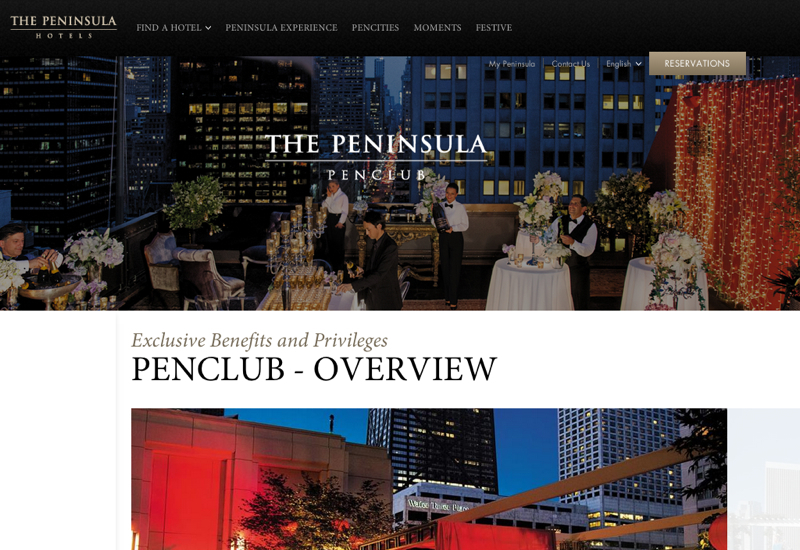 PenClub, The Peninsula Hotels' Preferred Partner Program, offers special amenities and perks if you book a Peninsula Hotel with TravelSort (see How to Become a TravelSort Client), via TravelSort's affiliation with Cadence, a PenClub member, or via another PenClub travel agency. Rates are the same as the best available rate (BAR) offered on The Peninsula Hotels' Web site, but with the value added amenities, you come out ahead when booking with PenClub and Virtuoso benefits (more on this below). What's the Difference Between PenClub Benefits and Virtuoso Benefits? PenClub benefits do not include a property specific amenity such as a $100 spa credit, a $100 food and beverage credit or afternoon tea for two, which is included in Virtuoso benefits. PenClub benefits do, however, include upgraded welcome amenities, flexible check-in/check-out and a complimentary 30 minute extension on any 50 minute body or facial spa treatment, which are not Virtuoso benefits. Yes! This is great news, since it means that you can enjoy the property specific amenity from Virtuoso, as well as the flexible check-in/check-out, upgraded welcome amenities and 30 minute extension for 50 minute facial or body spa treatments from the PenClub benefits. Note that there is no duplication of benefits, however: you can't have 4 breakfasts per day, etc. What Are the Advantages of Booking with PenClub/Virtuoso vs. AMEX Fine Hotels & Resorts? Peninsula PenClub Preferred Partner Upgrades are prioritized BEFORE AMEX Fine Hotels and Resorts upgrades. Peninsula PenClub benefits are only combinable with Virtuoso benefits, NOT with AMEX Fine Hotels and Resorts rates. Dedicated and personalized assistance with your entire trip from TravelSort, who will work closely with The Peninsula hotel to ensure you have a fantastic stay. Most AMEX FHR agents have never stayed at a single Peninsula hotel (many have never traveled abroad) and are order takers, not true luxury travel advisors. No–PenClub and Virtuoso benefits may not be combined with corporate, group or other discounted rates. There sometimes are, however, limited time special offers such as the PenClub 3rd Night Free offer described above in this post. Can I Book PenClub or Virtuoso Rates Online? No; you can't make PenClub or Virtuoso reservations yourself. You need to be working with a PenClub luxury travel advisor, such as TravelSort. How Do I Become a TravelSort Client to Make a PenClub / Virtuoso Booking? Please first read our How to Become a TravelSort Client page, and if it sounds like a good fit, complete our New Client Request form including credit card details so that we can make reservations on your behalf and fax it back to us at the number provided on the form.